Is there a fund that can help you build wealth over the long term and help you save tax, simultaneously? Yes, there is! The Quantum Tax Saving Fund (QTSF) invests in equities and also allows you to save tax u/s 80 C of the Income Tax Act. Please note that your investments in this fund (like all ELSS funds) are subject to a lock-in period of 3 years. 1. Optimizes tax-saving under Section 80C. 2. Minimizes risk by pursuing bottom-up stock selection. 3. Has a lower portfolio turnover. 4. Holds cash when stocks are overvalued - no derivatives and no hedging. 5. Has among the lowest expense ratio in its category. Solution For: Your tax saving needs, with dual benefit of tax saving and wealth creation. • Invests primarily in equity and equity related securities of companies in S&P BSE 200 index and to save tax u/s 80 C of the Income Tax Act. Investments in this product are subject to lock in period of 3 years. The Scheme is co-managed by Mr. Atul Kumar and Mr. Sorbh Gupta. Mr. Sorbh Gupta is the Associate Fund Manager effective from October 1, 2016. Past performance may or may not be sustained in the future. Returns are for Growth Option. Available for All Investors - Existing and New. What is Quantum Tax Saving Fund or QTSF? There is a saying in the world of investing, which is “higher the risk, higher the gain”. This is very significant when we speak of investing in the stock markets or Equities. Over the long term (5 years or more) Equities tends to give better returns to the investor, which also goes with the inherent risk of investing in Equities. For example over the last 10 years the BSE Sensex has given returns in the range on 18-20% (Source Bloomberg), which is probably higher than other vehicles of investment. However, we know how unpredictable the markets can be, hence sound investment strategies like a bottom-up stock selection process can be used to minimize risk. Click here to read more about Investment Philosophy. An Equity Linked Savings Scheme or ELSS is a mutual fund scheme that invests in equity and equity related securities and are eligible for a deduction under section 80C of the Income Tax Act, 1961. These schemes have a lock-in period of three years, and thus, investments made in such a scheme cannot be redeemed / switched out before the completion of 3 years since the date of investment. Quantum Tax Saving Fund - QTSF is an open ended equity linked savings scheme or ELSS having 3 years lock in period. Open Ended Scheme means it is open for purchase and redemption on all business days. Investors can conveniently buy and sell (after the lock in period) units at Net Asset Value ("NAV”) based prices offering complete liquidity. • Quantum Tax Saving Fund helps you save your taxes. Investments in the Quantum Tax Saving Fund are eligible for tax benefits under section 80C of the Income Tax Act, 1961. Thus Tax saved = Money earned. • Quantum Tax Saving Fund helps to Reduce Churning (frequent buying and selling) of portfolio. It has Lock in period of 3 years which helps to reduce portfolio churn as the fund manager does not need to re-adjust the portfolio to meet frequent redemptions. This could result in reduced recurring expenses and could also positively impact potential returns. • Quantum Tax Saving Fund follows disciplined research and investment process. • Quantum Tax Saving Fund consists of a well balanced portfolio - typically 25 to 40 stocks, across various sectors. What is the Investment Objective of the Quantum Tax Saving Fund? The investment objective of the scheme is to achieve long-term capital appreciation by investing primarily in shares of companies that will typically be included in the S&P BSE 200 Index and are in a position to benefit from the anticipated growth and development of the Indian economy and its markets. What are the different features available under the Quantum Tax Saving Fund? Systematic Investment Plan (SIP): This feature enables investors to save and invest periodically over a long period of time. Know more about Systematic Investment Plan (SIP) in detail. Systematic Withdrawal Plan (SWP): This feature enables an investor to withdraw amount/units from their holdings in the Scheme at periodic intervals through a one-time request. Please note that you can avail this Option only after completion of 3 years from the date of allotment of units. Know more about Systematic Withdrawal Plan (SWP) in detail. Systematic Transfer Plan (STP): This feature enables an investor to transfer fixed amounts from their accounts in the Scheme to another scheme within a folio from time to time. Please note that you can avail this Option only after completion of 3 years from the date of allotment of units. Know more about Systematic Transfer Plan (STP) in detail. View switch matrix for the applicable NAV. Triggers: A trigger is facility that allows you to specify an exit target (linked to value or time) or to receive an update when the desired levels are reached. The moment this target is achieved, the trigger gets activated. There can be Alert triggers or Action trigger. View the FAQs on Trigger Facility. Where will Quantum Tax Saving Fund invest? What is the Current portfolio? The investment strategy of the Scheme will be to invest in a basket of stocks after using intensive fundamental analysis, both quantitative and qualitative, monitor the portfolio actively but not so as to engage in excessive trading, and control risk by keeping the portfolio adequately diversified. View the current portfolio of the Quantum Tax Saving Fund. What is the Benchmark of the Quantum Tax Saving Fund & Why? The scheme would be benchmarked to the S&P BSE 30 Total Return Index (TRI). It appropriately represents the returns from the S&P BSE 30 Sensex since it includes the dividend received from the S&P BSE 30 companies. Therefore, the aforesaid benchmark is most suited for comparing performance of the Scheme. The Scheme''s portfolio has a bias towards high liquidity stocks. S&P BSE 30 TRI therefore makes a good benchmark as it comprises large cap stocks which are highly liquid. Who is managing the Quantum Tax Saving Fund? Mr. Atul Kumar is managing the scheme. Click here to view his complete profile. Mr. Sorbh Gupta is the associate fund manager for the Quantum Tax Saving Fund. Click here to read the Addendum. What is the Minimum amount I need to invest or redeem in Quantum Tax Saving Fund? Please refer below table for the minimum amount required to invest or redeem in the Quantum Tax Saving Fund. How do I invest in the Quantum Tax Saving Fund? PLEASE NOTE THAT YOU NEED TO BE KYC COMPLIANT TO INVEST WITH US. Click here to know more about KYC. Choose your preferred mode and click on the below links to read more and invest with us. Please note that for ETF schemes i.e. QGF and QIF you will have to read the respective SID of the schemes. Who can and cannot invest in the Quantum Tax Saving Fund? What is the current expense ratio of the Quantum Tax Saving Fund? The expense ratio of the Direct Plan of the Quantum Tax Saving Fund is 1.29% p.a. with effect from July 1, 2017 (Post GST). What are the entry and exit loads for the Quantum Tax Saving Fund? There is No exit load if you wish to redeem or switch out from the scheme. Please note that you will be able to exit only after completion of 3 years from the date of investment. What are the different options/facilities available under the Quantum Tax Saving Fund? The scheme offers Growth Option and Dividend Option. If you decide to opt for the dividend option, you would have to choose Dividend Payout facility. We have not paid out dividends since our Inception, but, we do know how to manage your money, and manage it well – our NAV has nearly doubled, and our expense ratios have moved down – ensuring you of even better returns. Read our article on "We invite you to declare your own Dividend". Can I hold the units of the Quantum Tax Saving Fund in Demat mode? Yes, there is an option to hold the units in dematerialized mode. To avail the same you should have a Demat/beneficiary account with a DP and need to mention all the details of your account no. and DP while filling the application form. Also please note that SIP is allowed in Demat mode BUT Switch in/ Switch out/ Systematic Withdrawal Plan/ Systematic Transfer Plan are currently not available in the demat mode. View the FAQs on Demat. 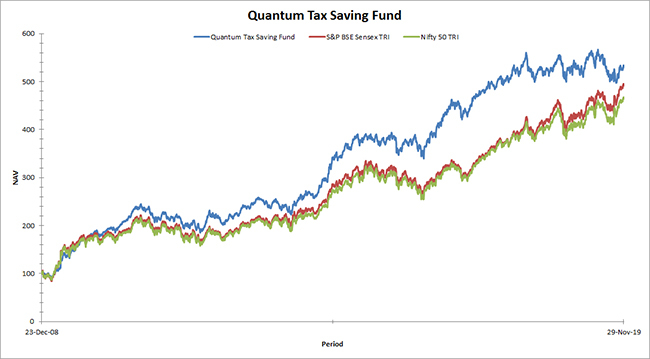 How has the Quantum Tax Saving Fund performed? To check the performance of the Quantum Tax Saving Fund you will have to go through the current factsheets. Tell me more about the NAV applicability and cut-off timing of the Quantum Tax Saving Fund. NAV applicability refers to the NAV at which a transaction is affected. A cut-off time is set by the fund and all investments or redemptions are processed at that particular NAV. This NAV is relevant if the application is received before that cut-off time on a day. A different NAV holds if received thereafter. Every Mutual fund follows standard cut-off timing depending on the scheme type which are in compliance with SEBI guidelines. Know more about the NAV applicability and cut-off timings of the Quantum Tax Saving Fund. Tell me about the Tax implications if I invest in the Quantum Tax Saving Fund. Taxation of Mutual Funds in India can be divided in two parts Capital Gains & Dividends. Know more on the Tax implications.